Includes the names: Joyce Rupp, Joyce Rupp, Joyce Rupp O.S.M. 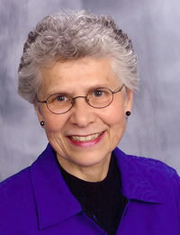 Joyce Rupp is an award-winning Catholic author who is well known for her work as a spiritual "midwife" and retreat and conference speaker. She has led retreats throughout North America, as well as in Europe, Asia, Africa, Australia, and New Zealand. She is also the co-director of The Institute of Compassionate Presence, a member of the Servites (Servants of Mary) community, and a volunteer for Hospice. Joyce has a Bachelor of Arts degree in English, a Master of Arts degree in Transpersonal Psychology, and a Master of Religious Education degree. She currently resides in Des Moines, Iowa. Joyce Rupp is currently considered a "single author." If one or more works are by a distinct, homonymous authors, go ahead and split the author. Joyce Rupp is composed of 4 names. You can examine and separate out names.